Danny is upset that Max doesn't want him to live with him. Max thinks he and Danny would just argue again if they lived together - they only get on well now because they're living apart. Danny comes to see Max at work and has a chat. Aunty Gwen turns up at the Robinson house. Helen is shocked. Jim says that Gwen had better come in. Gwen calls hello to Helen, but she walks off into the kitchen without looking back. Julie and Terry greet Aunty Gwen and she explains she's just come to say hello and to thank them for the invitation - she wasn't expecting it. When Gwen has gone, Helen storms in and rants at Julie for what she's done. Helen insists she'll never forgive Gwen and Jim says that Julie should be ashamed of herself. HELEN:(tearfully) Look, for once in your life, will you stop interfering in everyone's business but your own. I'm sick to death of your busybodying, I've had enough, Julie! Helen walks off to her bedroom in tears. 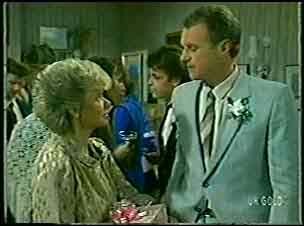 Daphne apologises to Terry for asking her about Shane before. The guys are all out on a bucks night - weirdly, since Paul the groom is still in Singapore! 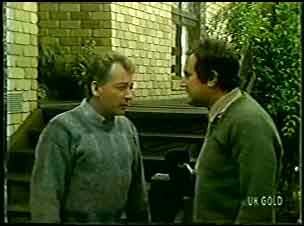 When Terry has gone to bed, Des and Shane stagger in wondering where Paul is. Daphne explains that Paul is in Singapore. 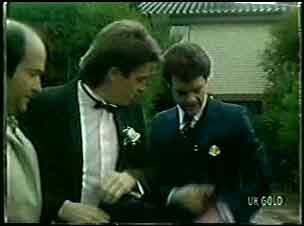 They are rather drunk and Shane says that he can't stand in for Paul at the real wedding - he likes his freedom too much. Daphne starts talking to Shane about their relationship. She says if Shane wants to be just good friends, he's got it. Shane says there's nothing between him and Liz. Daphne calmly tells him that it's strange how one night could wipe out all the weeks and months they had together. Des sticks his nose in at this point and tells them to just kiss and make up. So they do! Terry comes out and sees them kissing. She goes back to bed, sadly. Richard has come round to see Maria, who's dressed up for the wedding. 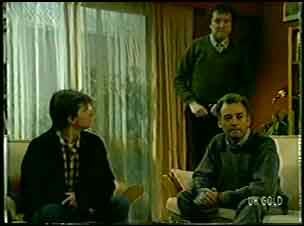 He asks after Danny and Maria tells Richard that Danny isn't coming to Hong Kong, nor is he going to stay with Danny. RICHARD: You're not coming with me, either. Maria says there's nothing they can do - Danny is her responsibility. Richard thinks there must be a way around it, but Maria says it must be all or nothing. RICHARD: So...you want me to go. MARIA: You can't stay and I can't go. It's fun, isn't it. RICHARD: Maria. I wish I could do something. MARIA: There's nothing you can do. Just...go quickly. Richard goes to the door. MARIA: I'll always do both. Richard meets Max who is coming up the stairs. Max has obviously rushed over as his car engine is still running. Richard explains that Maria is going to stay to look after Danny. 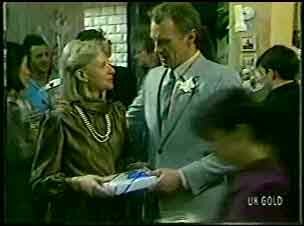 MAX: Good woman, Maria. Her happiness means a lot to me, you know. RICHARD: Means the world to me as well, Max. MAX: In that case, you'd better come and listen to what I've got to say. The longer I stay, the harder it gets to me. Danny is comforting Maria, and Shane has come in through the back door too. Maria is crying and goes to the kitchen when she hears a knock at the door. They all sit down in the living room with Richard, too. Max paces. MAX: Well. Time's come when a bloke's finally got to do something. DANNY: Good on you, Dad. MAX: You shut up, you. Caused your mother and me enough strife to last a lifetime. You've had your say. Now I'm going to have mine. Right. Well, I'll get straight to the point. I've been doing quite a bit of thinking over the last few days and...look, I know I haven't exactly been easy to get on with at the best of times. But it hasn't exactly been a bed of roses for me, neither. Like I say, I've been doing some thinking and any fool can see we can't go on like this! Maria...if you want to go away with Richard here, I think it'll cause us all a lot less pain and heartache if youse both go. Boys and me'll be OK.
Max is holding back tears throughout this exchange. Everything is prepared, but Paul still isn't back - he got on the plane, but it hasn't landed yet. Scott asks what Helen is going to do about Gwen. She says, nothing until after the wedding. Julie is arguing with the catering staff. Helen sends her off to get changed for the wedding. Julie starts arguing with Lucy about Basil, who has chewed her shoes. Terry is dressed in a robe and is worried about Paul's arrival. She says there's no point getting dressed if Paul can't make it. Des rings the airport again, but there's no guarantees that Paul will land on time. DES: I'll help you with your garter! There's a knock at the door and it's someone delivering a large present. 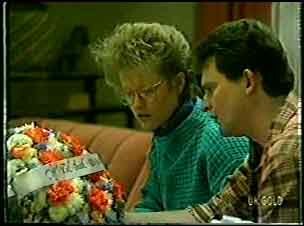 Des opens it for some reason and finds a wreath inside with the banner "Till Death Us Do Part". Max comes to see Jim and tells him he's moving back to Ramsay Street next week - because Maria is going to Hong Kong. Jim admires him for what he's done. Max says it was the only thing to do, otherwise no-one would have been happy. MAX: Not exactly of beans, you know. To tell you the truth, I feel lousy, you know, like someone ripped me guts out. Max puts a brave face on as best he can. MAX: Can't stand here all day with a long faces. Got a bride to give away in a couple of hours. Make the second one today! 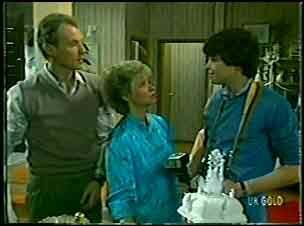 They laugh a bit and Jim agrees to come and get all the junk he left at Max's bedsit in return for Max helping with the chairs! Scott is taking photos of Terry, Julie and Lucy. The phone rings and Julie answers it - Paul has landed at last! Daphne is cutting Des's hair and tells him quietly that they can't tell Terry about the wreath - they've put it in the bin. They've told the police, but apparently no law has been broken. The guests have arrived and are having some pre-wedding drinks. Paul still hasn't arrived and Helen is worried. Just then there's a toot on a car horn, and it's Paul - he's arrived! Shane and Max usher Paul into the house to get ready. Everyone is looking out of the window seeing Paul arrive back. Everyone is very pleased. Aunty Gwen has arrived much to Helen's consternation. Jim tells Helen just to keep out of her way. Maria and Daphne chat about her going to Hong Kong. Julie is fussing over Terry and telling Lucy that she'd better remember her tasks as they rehearsed! 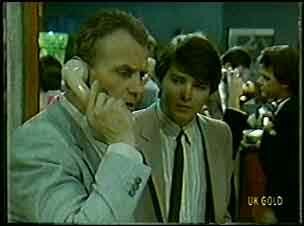 Scott answers the phone to a mystery caller and asks to talk to Jim - it's a matter of life and death. As Scott calls Jim to the phone, scary music starts playing. Jim picks up the phone and the person tells him that they've put a bomb under the house and it's due to go off in ten minutes.